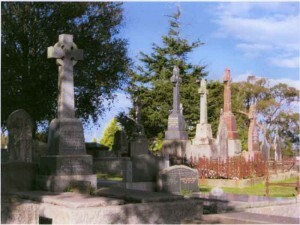 Royal Historical Society of Victoria | Narre Warren & District Family History Group Inc.
We’re celebrating History Week (23-30 October) with a tour of the Pakenham Cemetery at 11 am on 30th October 2011. Gazetted in 1865, this picturesque little cemetery has many stories to tell, so come and hear a few of them with us. Cost – $5 per person (tea and coffee supplied). Bookings are essential, to book or for more information contact Lynne, our research officer. If you’ve got family history intersts in the area, you might like to spend the afternoon at our Research Room which will be open from 2pm to 4 pm or the Berwick Pakenham Historical Society, also open on Sunday afternoon.